A young male bighorn was killed in a motor-vehicle accident about 7 p.m. July 18 on U.S. Highway 93 near Hemenway Valley. Fortunately, these types of accidents don’t happen often on Nevada roads, according to state officials. However, there is no way of keeping track of each incident, either. “There is no central reporting process for documenting such collisions and not all animal-vehicle collisions are reported,” said Doug Nielsen, conservation education supervisor for the Nevada Wildlife Department. Ashley Turner was driving a four-door Kia Soul northbound on U.S. 93 from a Willow Beach kayaking trip when the bighorn darted out. Turner said she was going about 45-50 mph. 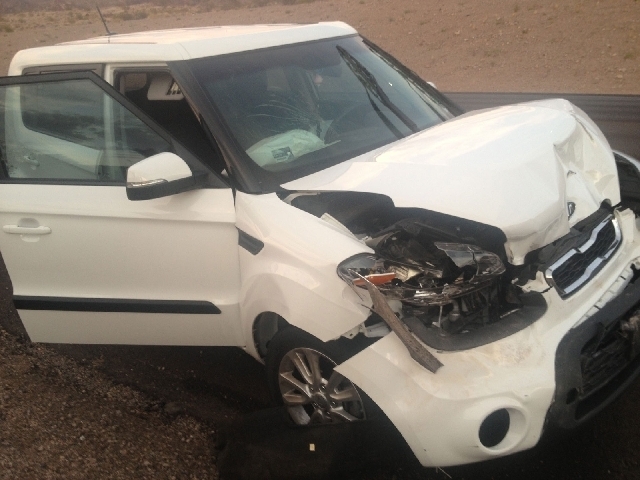 She and passenger CJ Ochoa weren’t injured, but the vehicle was totaled. “Thankfully, we were wearing our seat belts,” Turner said. National Park Service, Boulder City Police and Nevada Highway Patrol responded. Nevada Transportation Department was called in to dispose of the carcass. “Simply being involved in an animal-vehicle collision does not constitute a violation of the law,” Nielsen said. “Collisions often occur when an animal darts in front of the moving vehicle or even runs into the side of a vehicle while it’s moving down the road. The investigating officer determines whether a violation has occurred. “If a person kills a bighorn sheep illegally, then state and game wardens will investigate the crime and file the appropriate charges,” Nielsen said. He said there are a few ways to dispose of the carcass. A mature male bighorn was hit and killed near Railroad Pass Hotel nearly three years ago and the carcass was used for educational purposes.